These bars. Oh, these bars! They are delicious. I first saw these bars in an issue of Everyday Food a few years ago. I just love Everyday Food recipes because they're simple and not fussy, but they're consistently good. 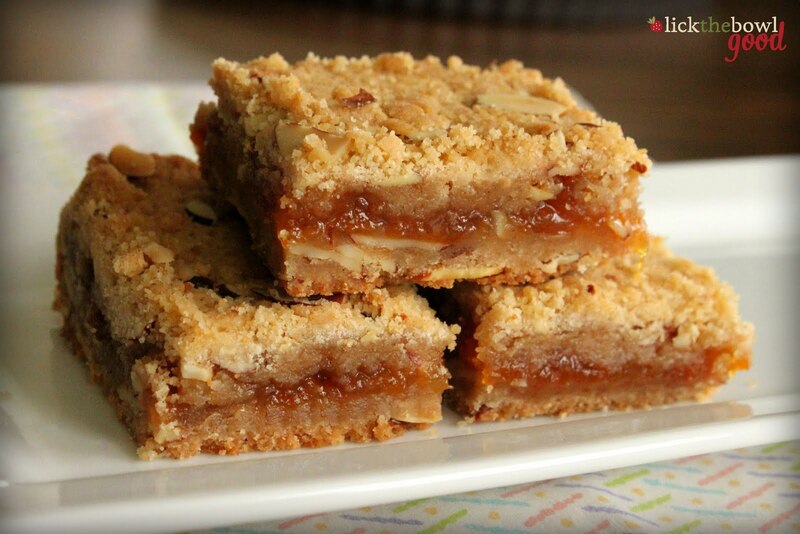 When I first made them, I used plum jam and took them to a friends' house for brunch. Then it seems that I lost the recipe. I looked for a long time through my old issues to find it with no such luck. Why it never occurred to me to just google it, is beyond me. Alas, I smartened up and found it on Martha's website. In my experience, not all of her recipes work for me, but this one is a keeper! 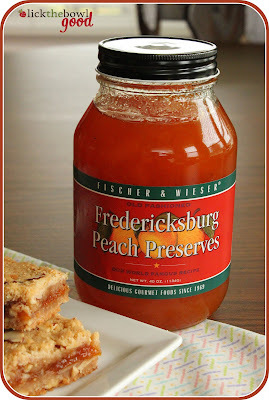 This time when I made the recipe, I chose to use Fredericksburg Peach Jam. Plum jam is my absolute favorite, besides homemade strawberry, but I used peach because Mr. H bought a half gallon of it from Costco a few weeks back. Okay, so I exaggerate slightly, but it was a 40 oz. jar...and that's a lot of jam! This batch went to my good friend Lori, who gifted me with my new logo. How do you express gratitude for something without spending a lot of money, yet you want to give something more than just a card? You bake something special and buttery, with quality ingredients and you hand deliver it. It doesn't get much better than that. These bars really are great. They're crumbly and crunchy, yet sandy and buttery. The sliced almonds add nice crunch and flavor and worked well with the peach jam and they're perfect for dessert or a weekend brunch. I may have had one or three for breakfast too :-) They're just really flavorful. One note of advice though, if your jam is really sweet then cut back on the sugar in the crust by a couple tablespoons. Feel free to substitute any flavor jam or preserve that you like. Make them for yourself or as a gift, just make them! Preheat oven to 350 degrees. Butter an 8-inch square baking dish. In a bowl, whisk together flour, cinnamon, salt, and baking powder. Gently press half of dough into bottom of prepared dish. With the back of a spoon, gently spread jam over dough, leaving a 1/4-inch border so the jam doesn't stick to the sides of the pan. Sprinkle remaining dough over top all the way to the edges; press gently to form top layer. Bake until top is golden, 25 to 35 minutes; cool completely in dish. Cut into bars with a serrated knife. This buttery and gooey bite is just for you. Open Wide! I'm with you, not all the Martha recipes I've made work either, but the ones that did were amazing! These look positively delicious. Perfect for breakfast with a nice hot cup of coffee. I love these bars and I'll definitly try these this summer with my plum jam! Ohhh these look soooo good!!! I have a fresh jar of the most delicious raspberry jam in my fridge - might have to give it a try with that! Thanks for the recipe! Just bought strawberry jam and those look amazing!!! Thanks! I am always looking for peach recipes because I'm in charge of a Peach Cook-Off every year. These look delicious. Thanks. My favorite, Peach. They look so yummy. Thanks. I totally agree with the Martha recipes - good to know one that's great. I just made strawberry jam so will have to try that in these! And by the way you look fantastic!! All the best to you for an uneventful pregnancy!!! Where's mine? This looks great. Mmmm! I'm dealing with an abundance of raspberry jam at the moment, so I will try this recipe! Mmm I love preserves in bars! So tasty sounding! AAAAAAAAAAHHHHHHHHHH. It's not working! I need that bite dangit!!! These look fantastic! I'm thinking of the apricot jam in my fridge. Yum!! Oh they look so good! I wish I could just grab one right out of my screen! I like the sound of Martha Stewart's voice. I don't know why, but it somehow calms me or does something to me, haha. And this morning I saw an episode of hers when she was featuring jam and something similar to this was on there and they looked darn tastey. I actually have some of my Mom's homemade blackberry jam that I need to use up, so this is perfect! These look delicious ... I cannot wait to make these this weekend. Thanks for sharing! Yup these would go prefectly on my counter :) I love peach and almond anything! I love these. I've made them with raspberry. I can't wait to try them with apricot! Glad you are doing well! uh... these are so going to get me in trouble. deep trouble. eat-the-whole-pan type of trouble. I have personally experienced your hand deliver of those amazing Maple Pecan shortbread cookies. Yes, you are right. It was one of the best gifts I've received. These do look simple, and the kind of cookie I'd love with a cup of quality tea. PS: I posted my version of Swedish Pancakes, and the photos I took at Sears Restaurant! I love it when I have all the ingredients for a recipe. I'm making these right now! I have tried many many of yor recipes. And they all were amazing! Thank you for another amazing recipe! 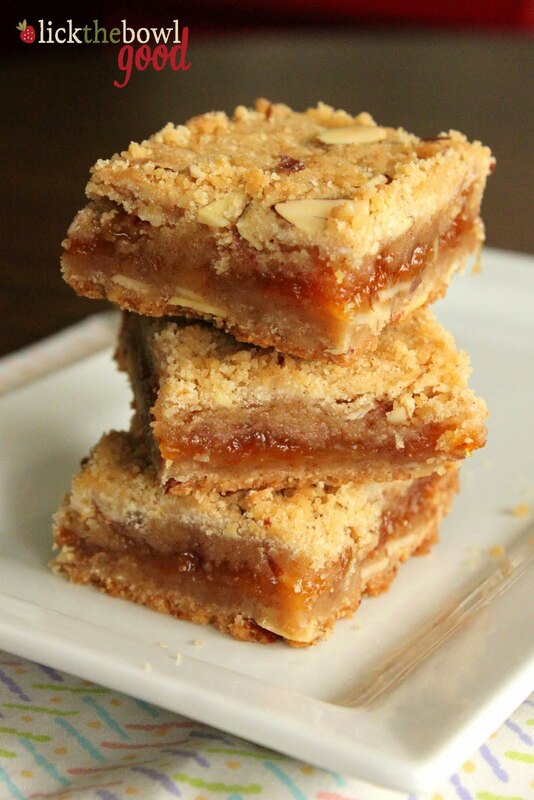 I love recipes for bars/slices. Yours just looks delicious! Great ingredients list! I made these this weekend and they were such a hit. Thanks for the inspiration. 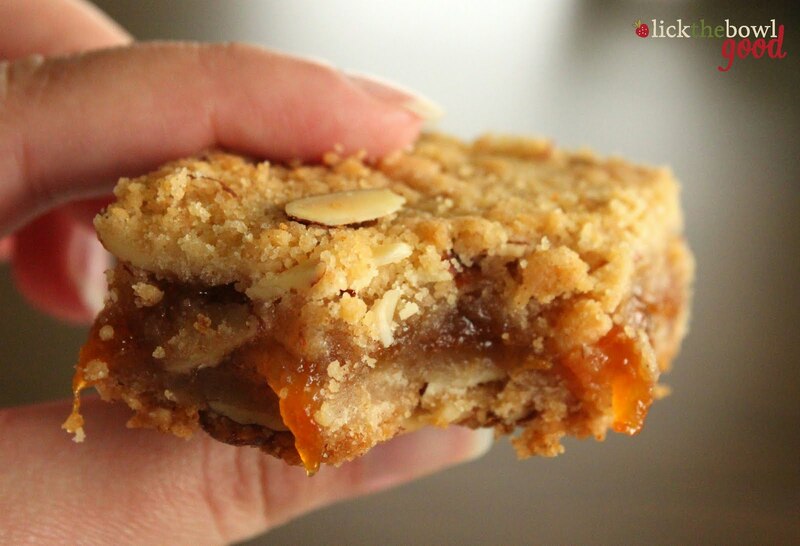 I used apricot jam and mixed in some almond extract to highlight the almonds in the crust. Delicious post!! 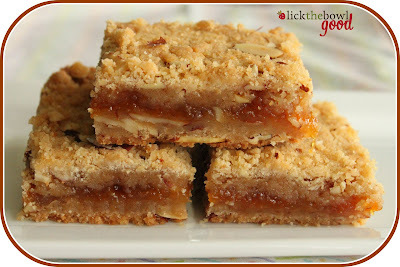 Yum, these look fabulous and so perfect to take to a BBQ/potluck! The new logo is awesome. Very very cute! The bars look pretty darn good too. I just stumbled across your blog and I must say- I'm a huge food blog addict and I want to make almost every recipe on here! Great photography, too! I love Everyday Food! MUST try these! just found your blog, loving all the recipes! Trying this one tomorrow! Oh these look amazing just like everything else I have checked out here on your site. So yummy! But I think I need to make a plate of these delicious bars today for sure. Thanks for the beautiful posts! Just made these! They are delicious! (I accidentally cracked a whole egg into the mixture and it was still good.) 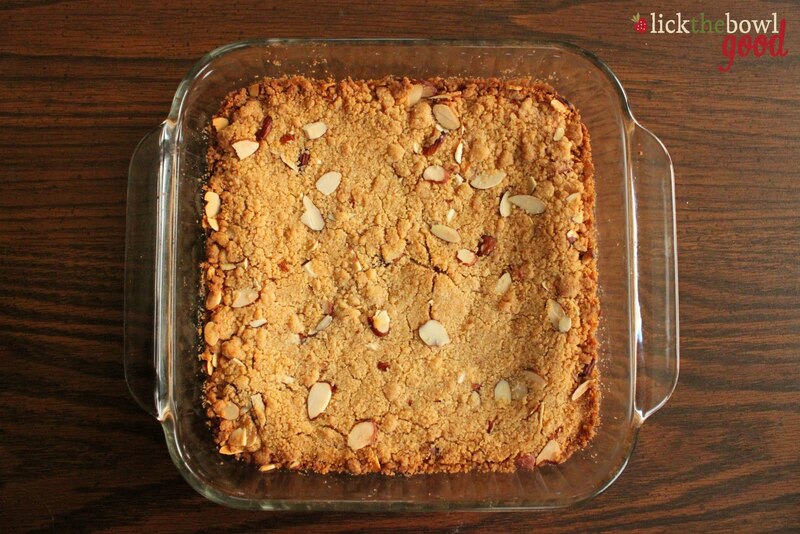 Buttery & almond-y. I've just made a raspberry tomato jam. (using some of my over abundance of ripe tomatoes. Don't need any more salsa.....so this looks like a good way to use some of my extra jam using tomatoes. 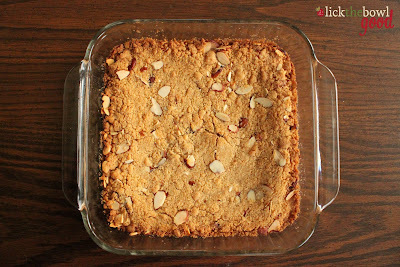 Looks like a quick easy dessert to take to friends too!